Well-known developer and 9to5Mac contributor Guilherme Rambo has released a new macOS utility named AirBuddy that extends iOS-like AirPods integration to the Mac. We were provided a copy of the utility to try out in advance. AirBuddy comes with a helper tool that allows you to enable the utility for AirPods. 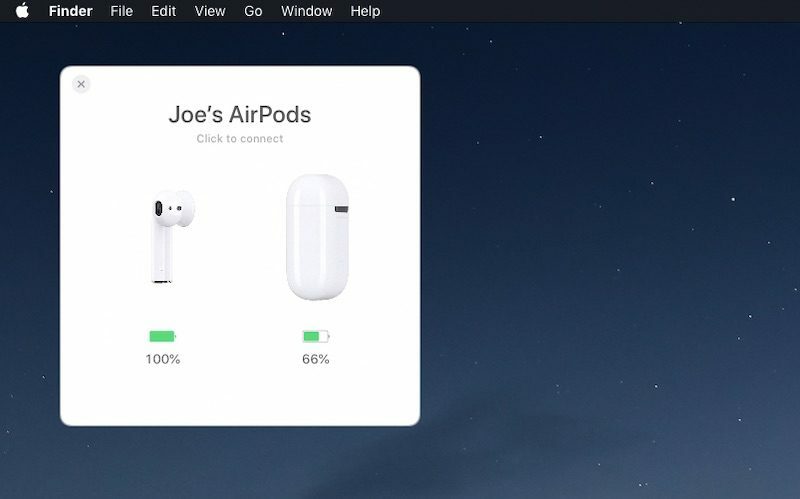 The helper tool also lets you choose where the floating AirPods status window appears on the desktop: left, center, or right. Then, when you open the AirPods case near your Mac, the status window automatically appears with the battery life of the AirPods and case, just like on an iPhone. The window also has a one-click shortcut to connect the AirPods. In our brief testing, AirBuddy worked quite seamlessly, although the status window did not always open. Rambo says the app relies on several factors to determine whether to show the status window, including the distance of the AirPods to your Mac, whether the AirPods are currently in use by another device, and so forth. 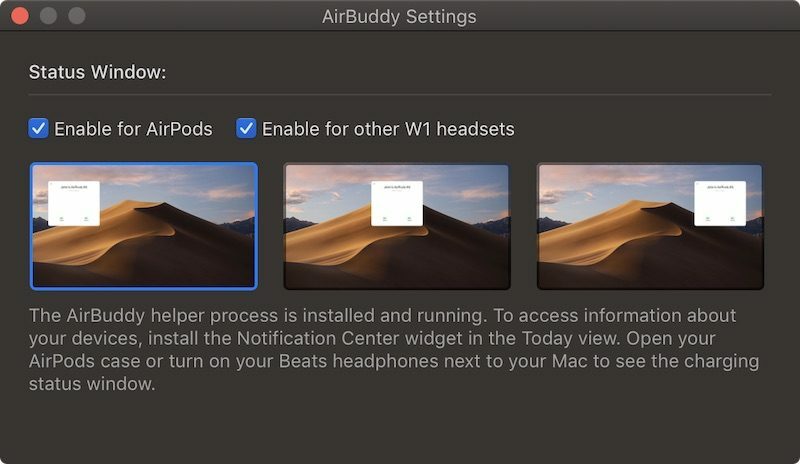 It is also possible to add AirBuddy as a Notification Center widget on Mac that displays the battery life of not only the AirPods and case, but the Mac itself, other headphones equipped with the Apple W1 chip like the BeatsX, Beats Solo3, and Powerbeats3, and other trusted, Wi-Fi-connected devices. AirBuddy requires a Mac with Bluetooth LE and macOS Mojave. The app is available via Gumroad for any payment of $5 or more. In our brief testing, AirBuddy worked quite seamlessly, although the status window did not always open. I've found that it doesn't always open on iOS either. Ahhh nice, I’ve seen him showing screens of this on Twitter and was hoping it’d get released. I have no idea why Apple hasn’t natively integrated this behaviour in macOS already. This is great. Very elegantly designed, and thus far it seems to "just work." AirBuddy has quickly replaced ToothFairy, and Magic Battery on my MacBook Pro. The only function it's missing that I'd really love to see introduced is a notification when any of the connected devices (selectable by the user) drops below a chosen charge threshold. So, for example, macOS would alert me when my AirPods have dropped below 10% charge. Or when my iPhone X has dropped below 15% charge. That would be very handy and a great fit for AirBuddy! Then it will be able to replace "iBetterCharge" on my MacBook Pro too. Big props to the developer for introducing a function Apple should have added a long while ago. Pretty nice stuff and looks very native. So much that Apple should "Sherlock it" on macOS 10.15. Since macOS is largely neglected, I doubt it would actually happen. So AirPods users should support the developer. Notable issue: Music doesn't pause when you pull an AirPod out of your ear. Instead it switches to computer speakers. Could be disruptive in a library setting. Unintuitive for folks that have gotten used to auto-pause. No need for beautiful UI covering half of a screen or complex algorithms to determine when to show it. Just discreet icon for one-click connect at any time. I like this tool, but I don't know, a minimum of $5? Seems like a lot for a simple utility that I can see somewhat within MacOS already, under the sound menu. Very Cool but not sure if it’s worth $5. It’s not that cumbersome to just view Battery Life from menu bar > sound. But seriously, it ain't a subscription or IAP. Does this work with Beats X? Bought it for my BeatsX and I cannot get it to work. If you read the developers web page it seams like you can only get battery status with other w1 headphones than AirPods. MacRumors text is ambiguous. The should update the text.